Although more space for intracorporeal suturing is provided, proficiency in suturing and tying techniques are important in completing a watertight anastomosis. Laparoscopic suturing is tedious and often responsible for the long operating times seen in most laparoscopic pyeloplasty series. Unfortunately, operation time is still the highest among therapeutic modalities for ureteropelvic junction obstruction. Nevertheless with increasing experience and improved instrumentation, operating times have decreased as confirmed in studies with larger number of patients (Table 1) (9,13,21-23). Conversion rates range from 1.4% to 20% (16,22), and are usually dependent on the ability to complete a free tension anastomosis (Table 1). Morbidity of transperitoneal laparoscopic pyeloplasty has been shown to be considerably less than that of open pyeloplasty (22). Complications have decreased with experience and range between 11% and 20% in latest series (Table 1) (24,25). A variety of complications general to laparoscopy and specific to the procedure itself have been reported (Table 2). Minor complications predominate with the most common being urine leak and persistent drainage, which are usually treated conservatively. With experience, improving methods of creating the anastomosis and securing drains can minimize complications. In all studies comparing laparoscopic versus open pyeloplasty, the laparoscopic approach provides less post-operative pain, shorter hospital stay, and faster recovery (27,28). Success rates in most recent series are above 90% and similar to those obtained with the open approach (12,26). Abbreviations: OR, operating room; CV, crossing vessel; FU, follow-up; AH, Anderson-Hynes; HS, hospital stay. When compared to retrograde endopyelotomy, the laparoscopic approach presents with more postoperative pain, longer hospital stay, and slower recovery. On the contrary, when compared to percutaneous endopyelotomy, these differences are not so prominent and all the above parameters are almost similar. Lack of standardization of pre- and postoperative investigations may confound interpretation of data when evaluating rates of success among various methods of treating ureteropelvic junction obstruction. As such, the definition of final success should comprise subjective improvement of pain analog scores along with objectively improved drainage. Intravenous pyelogram or nuclear renal scan with diuretic is the best way to evaluate for persistent obstruction. Retrograde pyelography is helpful with equivocal cases. With increasing experience similar operating times to open pyeloplasty have been achieved with retroperitoneal pyeloplasty. Some authors even reported shorter operating times than the transabdominal approach. 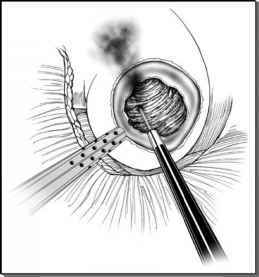 Open conversion is infrequent and occurs due to problems to create a watertight anastomosis without tension. This is attributed to the fact that laparoscopy allows direct evaluation of the ureteropelvic junction and therefore appropriate management of crossing vessels and dilated renal pelvis in a similar way to the open procedure. This may be why laparoscopy presents with better overall results than endoscopic management. When the anatomic conditions that predispose to failure of endoscopic management are absent, antegrade endopyelotomy and laparoscopic pyeloplasty present with equally good results (29). When compared to retrograde endopyelotomy, the laparoscopic approach presents with more postoperative pain, longer hospital stay, and slower recovery. On the contrary, when compared to percutaneous endopyelotomy, these differences are not so prominent and all the above parameters are almost similar (30). Good pyeloplasty results rely on selecting the appropriate technique. This depends from the anatomy of the obstruction encountered in each patient. For example, Fenger plasty is less extensive repair than dismembered pyeloplasty and should be used for short strictures with a not very dilatated renal pelvis. With the laparoscopic approach, the technique chosen, dismembered or nondismembered, can be selected intraoperatively, while taking into consideration the anatomy of the ureteropelvic junction obstruction. This obviates the necessity for detailed preoperative imaging of the ureteropelvic junction anatomy and renal vasculature.